As the 2009 season unfolds, news is reaching us that the small ship market may be hurting more than big ships, but not always because they are not doing well. 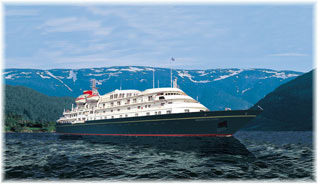 In the case of Seadream there seems to be question of the owner's other investments not doing so well. Meanwhile, Hebridean Princess may have an interested buyer, Spirit of Oceanus will not be going back to Alaska in 2010 and mystery surrounds future plans for the Andrea. This week we look at a few of these questions. Seadream Yacht Club for Sale? If there is an interested buyer, apparently it could be a good time to make an offer for Seadream Yacht Club. Not only has Larry Pimentel parted ways with line owner Atle Brynestad but Brynestad's own businesses in Norway, badly affected by the present recession, are apparently in "deep crisis" if we are to believe the Norwegian press. Two yachts capable of carrying 112 each could thus be available for the right buyer. Built in 1984 and 1985, they are a little older than the 1991-built Hebridean Spirit that just changed hands this month. Others, however, are not so quick to believe this. Brynestad has been involved in this business since he founded Seabourn in 1987, and having many other private interests, he is not seen as likely to let Seadream go. He did sell off Smart Club to Swedish interests last year and his CG Holdings is now making available for sale a number of other assets in the Brynestad empire. Meanwhile, Seadream itself is said to be doing well in the present circumstances, with each ship probably generating in excess of $50,000 in revenues a day. Where did Hebridean Spirit Go? The 90-guest Hebridean Spirit has now departed the scene, delivered earlier this month to new owners who are reported to be from Dubai, where one-time fleetmate easyCruise One was sold not long ago. The Spirit was apparently handed over in Mauritius on April 7 and renamed Sunrise and will now be used as a private yacht. As soon as Hebridean had collected the reported sale price of $7 million, the company was placed into administration and Ernst & Young were appointed as receivers. And the first thing the receivers did was to post the following notice on the Hebridean web site: "On 7 April 2009, the sale of the Hebridean Spirit was completed. In March 2009, all customers of the Hebridean Spirit were contacted to advise them of the forthcoming sale and were informed that a full refund would be given to those who had booked cruises on the Hebridean Spirit. We regret to advise that the Joint Administrators are not in a position to refund any customers in respect of the cancelled Hebridean Spirit cruises. Customers may be protected by the Air Travel Organiser's Licenses (ATOL) and should contact ATOL directly," advising them to contact the Civil Aviation Authority, who oversee the ATOL consumer protection scheme. The notice further stated that "customers should also check their travel insurance policy since it may provide cover for the cancellation. The type of cover provided will vary according to the type of policy taken out. Your policy may cover the complete or partial cost of the original booking purchased. If you paid by credit card, you may also be protected by Section 75 of the Consumer Credit Act 1974. You should check with your credit card provider for further advice." One minute, people that had paid for a cruise on the Hebridean Spirit were expecting a refund and the next they were told by receivers they were not getting one. Who Wants the Hebridean Princess? 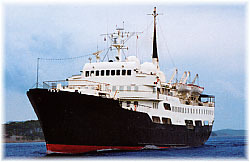 With Hebridean down to one ship, Ernst & Young then advised that the cruises of the 50-guest Hebridean Princess, a ship that many will remember was chartered by the Queen for her 80th birthday, would not be cancelled and that the company would continue to operate her as a going concern while the possibility of finding a new owner was explored. Colin Dempster, from Ernst & Young, was quoted as saying "We are aware of the strength of the Princess brand and interest in the vessel has already been received. This has allowed us to secure funding to continue the Princess schedule as planned whilst we pursue a sale as a going concern." Recent reports indicate that there is indeed an interested buyer and that they have been given a short period of exclusivity to try to reach an agreement on a sale. But the party has not been named. Some press reports speculate that it might be Swan Hellenic, which is now part of All Leisure PLC, the same firm that owns Voyages of Discovery. As they say, watch this space. Cruise West has already advised all its agents and the public that if they wish to cruise to Alaska in the 114-guest Spirit of Oceanus, then they had better do it this year, as she will not be returning to Alaska in 2010. Her new itineraries are now the subject of speculation although Cruise West are expected to make an announcement in the near future. Times have been tough for Cruise West and while they have been expanding into cruises in the Antarctic, the Galapagos and on the Danube in full charters, three of their regular Alaska ships will remain in lay up this summer. It has been announced today by Cruise West that in 2010 it�will be sending its Spirit of Oceanus on a round-the-world cruise, details of which are shortly to be announced. 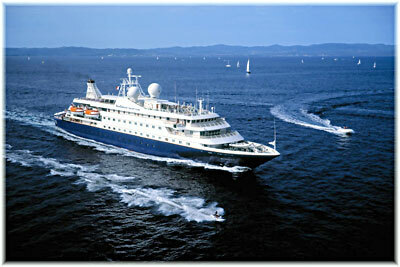 The voyage will start in March 2010 and will be bookable as either a full world cruise or in 24 sectors. On another note, Cruise West are said to be negotiating the charter of some of their small ships for use at Vancouver during the 2010 Winter Olympics, which of course are now only a matter of months away. This would give them some useful additional winter revenue. What Happened to the Andrea? Meanwhile, there have been reports that Elegant Cruises & Tours' 110-guest Andrea, which has been cruising the Adriatic each summer and the Antarctic by winter, will not return to the Antarctic again. Elegant are said to be researching other winter itineraries for this ship. But last week came word that the Andrea has disappeared from their web site as far as her Adriatic summer program is concerned, and no employment is now shown for her. The 60-guest Monet is now shown as the only ship to undertake these cruises this year and it seems that Andrea's summer cruise program has now been cancelled although we have no reports yet as to why. Seeing as the ship is Croatian-crewed it seems especially odd that her Adriatic season may have been cancelled.